Pictured at the presentation of a cheque to Padhraic Barret, Rock Rose House, part of the proceeds from the Strictly Come Dancing event held in Breaffy House Hotel L-R: Justin Guthrie, Fiona Byrne, Eugene Connolly & Padhraic Barrett from Mayo Cancer Support, Majella Mulchrone & Paula Murphy. Photo © Ken Wright Photography 2014. We are immensely proud to have been involved in should a wonderful local fundraiser which exceeded all our expectations. It hard to believe we hosted our Strictly Come Dancing event over 7 months ago and secretly we all kinda miss it! Earlier this summer we presented a cheque for €7,400 to Rock Rose house and they were all so thankful for the donation. 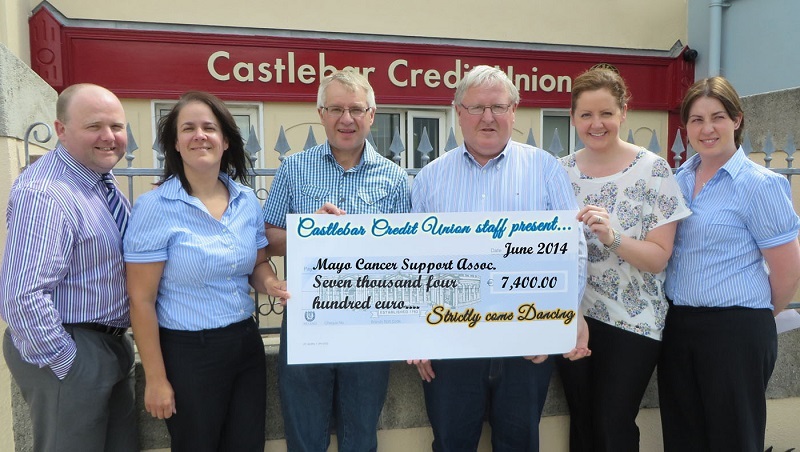 The money was put to very good use offering cancer care support to so many Mayo families. We visited St Anthony's school recently to see how they spend the funds from strictly. 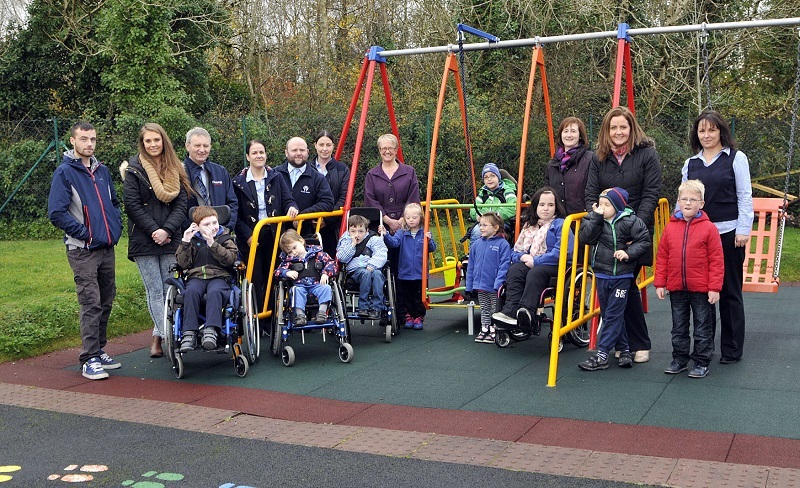 They are now proud owners of a wheelchair accessible swing which can be used by 3 pupils at the same time. It was a very proud moment indeed to see pupils of all abilities having fun on their new swing. It makes such a difference to actually see where the money goes to and on that note we would like to take this opportunity to thank all the dancers, the board & staff of Castlebar Credit Union, to each and every one of you who bought a ticket, to all the businesses who sponsored the event and to everyone who volunteered their time, none of this would have been possible without you. You should all be very proud. 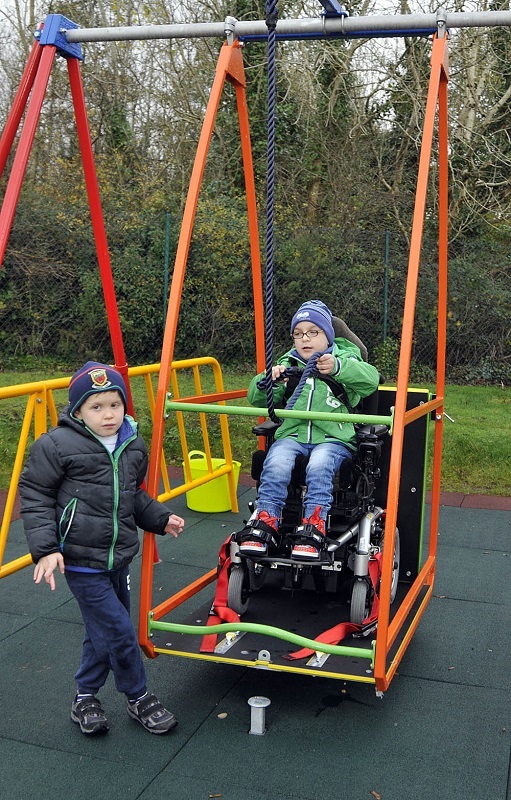 Dylan Mulchrone watching his friend Mateus Dudzinski, enjoying having a go on the new swing, which was purchased from the proceeds received from the Strictly Come Dancing event which was held in the Breaffy House Hotel. Photo © Ken Wright Photography 2014. Pictured at the presentation of a swing by the members of the Strictly Come Dancing committee, who divided the proceeds from the event between St. Anthony's and Rock Rose House Front L-R; Sean Connor, Thomas Connolly, James Connor, Maya Bullard, Mateus Dudzinski, Joanne Burke, Adina Keane, Dylan Mulchrone and Cian Coughlan. Back L-R: Kevin Flynn, CU, Grace Lynch, CU, Pat Egan, Parents Association, Fiona Byrne, CU, Justin Guthrie, CU, Paula Murphy, CU, Carmel O’Brien, CU, Fiona Byrnes, Principal St. Anthony's, Majella Mulchrone, CU and Anna Keane, CU. Photo © Ken Wright Photography 2014. On behalf of Mayo Cancer Support Rock Rose House we were delighted to be included in a very well run fundraiser for two very worth charities. With the funds that were given to us we were able to offer more counselling services to very needy people both young and old. Since Spring we have opened our services in Ballina for two days per week, Tuesday and Wednesday in the Family Resource Centre. In providing for the needs of people living with cancer, their families,and friends we have been able to have our staff trained in new and different therapies. The funds given to us by the Castlebar Credit Union Strictly Come Dancing fundraiser has been a huge benefit to us this year and for this we say a sincere thank you.